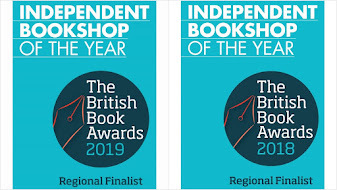 At first glance, this may have looked like another of our "They Shouldn't Do It In A Bookshop" events, but here the match was perfect. 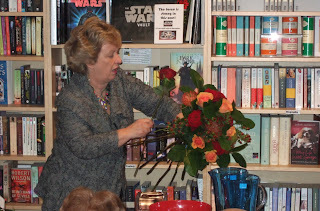 Judith Blacklock is not only one of the country's pre-eminent floral designers (and I can definitely confirm that having watched her Wednesday night) but she is also a bestselling author on the art and practice of flower arranging. We welcomed her to Mostly Books last night for a stunning event which - if you missed it - we'll definitely do again in the next few months. I first met Judith earlier this year at the Society of Authors in London, and again at her eponymous (and completely gorgeous) Flower School in Knightsbridge (in Kinnerton Place, just round the back of Harvey Nicks). As well as running the school, and teaching flower design to students from all over the world, Judith has written a number of bestselling books on flower design - including a title for the Teach Yourself series which is (I believe) their biggest ever seller. 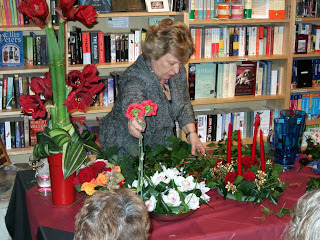 Judith is also the editor of the Flower Arranger magazine. Now, I have to admit first off that my knowledge of flower arranging (and floral design books specifically) is not as great as my knowledge of, say, cookery books. Having got to know her, and now having seen her in action, however, I would say her style is a combination of Sophie Grigson and Heston Blumental (bear with me on this one). She has a very down-to-earth attitude that belies an utter professionalism and passion for her craft, but she also has Heston's pursuit of the fundamental principles that underlie the subject. If all that sounds a bit pompous, what I'm trying to say is that Judith believes there are fundamental principles which anyone can learn in flower arranging - even if it's just placing a few flowers in a jug - and she is remarkably effective at getting them across to her students or an audience. 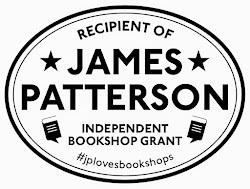 She came to Mostly Books Wednesday night to do just that. The event didn't start in the most auspicious way. Attrocious traffic conditions in London meant that Judith was delayed - and of course, we have the ongoing Stert Street resurfacing which meant that the road was due to be closed. Now, I've mentioned before that for some reason our events often seem to coincide with some major highway maintenance. Little did we know, however, that later that evening, the workman - probably under pressure to re-open the road as quickly as possible - were to slice through a major electricity cable and black out the entire street. The road was closed all day today, gridlocking most of this part of South Oxfordshire. Nice one. Earlier in the day a delivery of six fine Amaryllis had arrived, courtesy of Gary and Matthew at Fabulous Flowers in Abingdon. By the way, if there is anyone in Abingdon who doesn't know what a gem of a flower shop we have in the town, their shop is on Bridge Street. And the boys have just opened their second shop next to Gees, on the Banbury Road in Oxford. We had wine, gentle music and the shop decked out in its Christmas finery - and Judith hit the ground running from the moment she arrived. My shaky camera work really doesn't do justice to the demonstration she gave, but here we go. Note how the arrangements - music like - build into a grand finale which I've tried to show at the end of the post. Starting with some basic principles (including vase and foliage selection) she proceeded to show techniques for vase and hand-tied arrangments. She was also keen to get everyone involved, so those sitting on the front row were busy for most of the evening. Now, I've never heard people gasp at one of our events before - but when we got onto "leaf manipulation" everyone was gripped. I'll not reveal too many of Judith's top tips in this post, but I glimpsed the reasons why George Orwell satirized the plant - it lasts for a long time, surviving all kinds of indignities. It's a firm favourite amongst flower arrangers. By the end of the evening, Judith had produced a fabulous collection - including a stunning arrangment of the Amaryllis (seen here on the left of the photo). 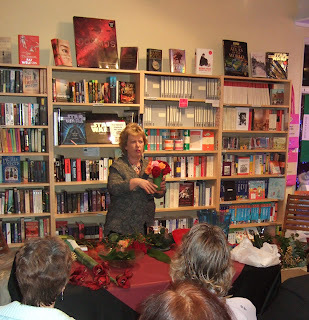 Judith answers questions, signed books, and was whisked away by her husband after staying to chat to everyone who came. It was a wonderful evening, and my thanks to Judith for accepting our invitation. Everyone had a wonderful and inspiring time. Pop into the shop to get signed copies of her Encyclopedia of Flower Design and Flower Recipes for Winter books - or to have a look at the flowers!